Attendees of the Midlothian Science Festival got up to speed with the fibre technology of Digital Scotland’s Superfast broadband this week. More than 3000 homes and businesses in Midlothian are now able to connect to high-speed fibre broadband thanks to the £410m Digital Scotland Superfast Broadband programme. Sarah Keer-Keer, a director of the Midlothian Science Festival, and Councillor Jamie Bryant, of Midlothian Council, joined members of the Digital Scotland Superfast Broadband team to unveil one of the new street cabinets that will serve part of Newtongrange. To have access to this latest fibre broadband technology local people need to sign up for the new services with an internet service provider, as upgrades are not automatic. Other nearby places where premises have benefited from the Digital Scotland rollout, led by the Scottish Government, include Ford, Temple, Gorebridge, Dalkeith and Penicuik. More local coverage will follow as engineers from Openreach, BT’s local network business, continue work on the ground. Sarah Keer-Keer added: “It is very exciting news that Newtongrange is now covered by fibre broadband. It will certainly have a positive impact on the area. 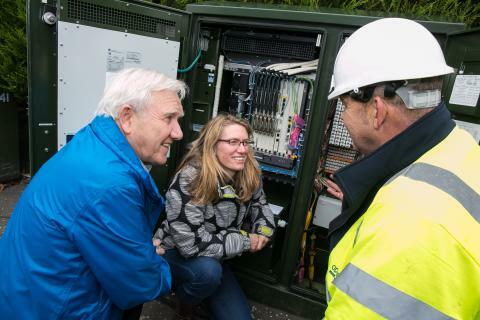 Across Scotland, more than 645,000 premises are now able to connect to fibre-based services through the £410 million Digital Scotland project, led by the Scottish Government. That includes around 300 households and businesses in Newtongrange, building on existing commercial coverage locally. BT is investing £126m in the Digital Scotland rollout, in addition to its commercial coverage. Liz Mallinson, BT Scotland’s Fibre Broadband Director, concluded: “The independent ThinkBroadband website shows that thanks to the DSSB programme and commercial investments, more than 82 per cent of premises in Midlothian can now access superfast broadband speeds of 30Mbps and above.